I've seen a few sites marking the 143rd birthday of cartoonist Winsor McCay today. 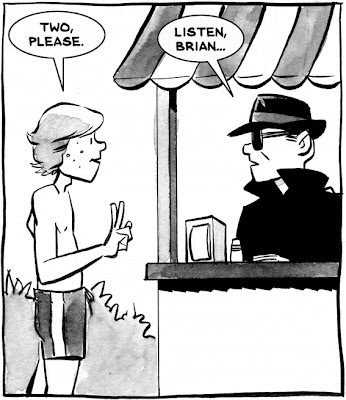 Now, I've always thought there was something odd about wishing a dead person a happy birthday, and I don't remember any celebrations of McCay's 142nd or 141st, but for the man who's Number One on my personal "Greatest Cartoonists of All Time" list, that's all the excuse I need. 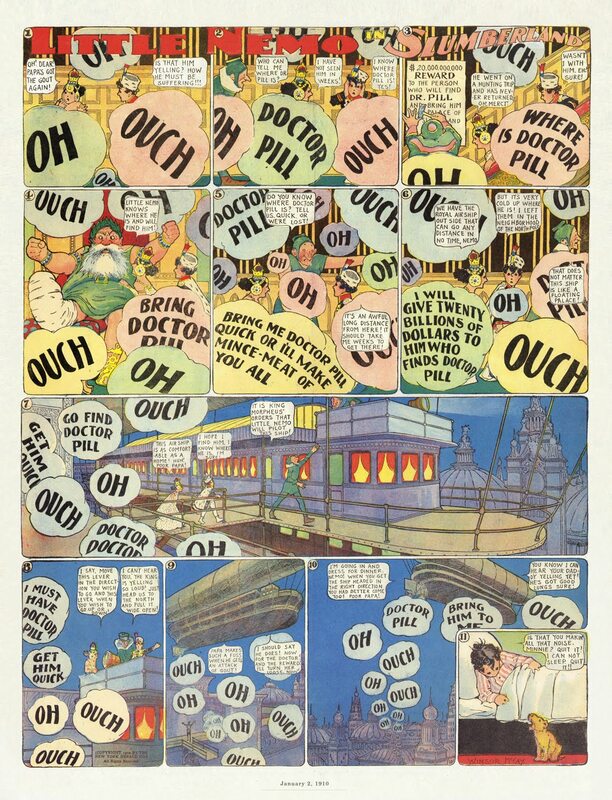 If you're a comics fan who's not familiar with McCay's Little Nemo in Slumberland, you owe it to yourself to get familiar. 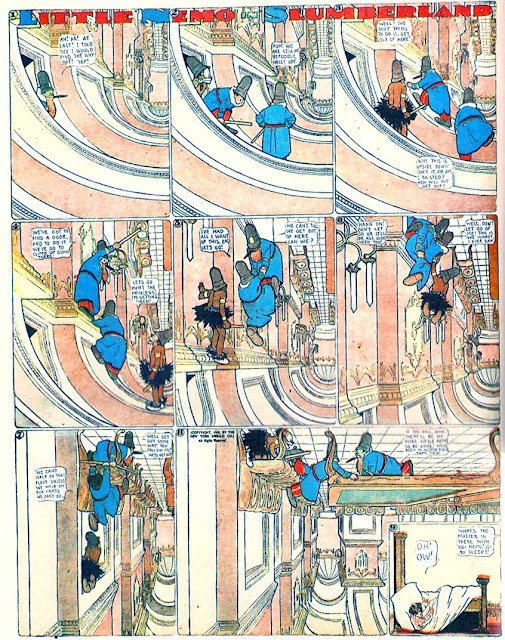 On a four-color canvas of enormous broadsheet pulp, McCay took his dreamy hero Nemo on the most lavishly illustrated and imaginative adventures in Sunday funnies history. I'm posting a few examples below, and even sizing them as large as I can gives just the merest hint of McCay's fine detail and draftsmanship. 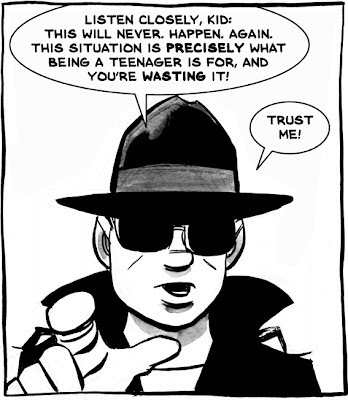 Although I think these comics stand on their own in terms of art and storytelling, some historical perspective helps. 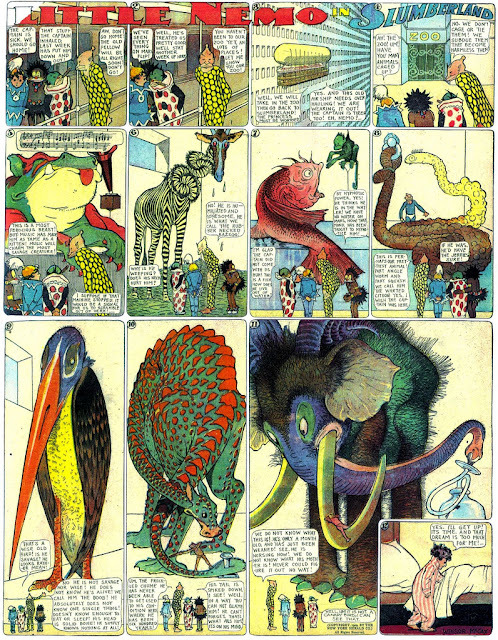 McCay did Little Nemo between 1905 and 1914, then briefly revived it from 1924-27. 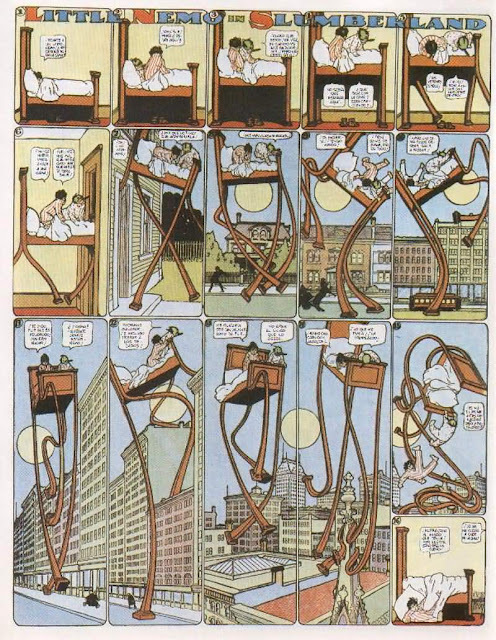 The strip began very soon after the modern newspaper comic was invented (generally, though not uncontroversially, credited to The Yellow Kid in 1895), yet McCay was already doing some very sophisticated formal work. He played with panels, perspective, color--in the last example above, just look at his clever use of word balloons as graphic and narrative elements. If a modern critical darling were doing stuff like that today, he'd be hailed as a genius. McCay did it a century ago. McCay was also a pioneering animator. In 1914, 14 years before Walt Disney's rubber-legged Steamboat Willie, McCay created Gertie the Dinosaur, a creature with volume, mass, and personality. Gertie breathed. 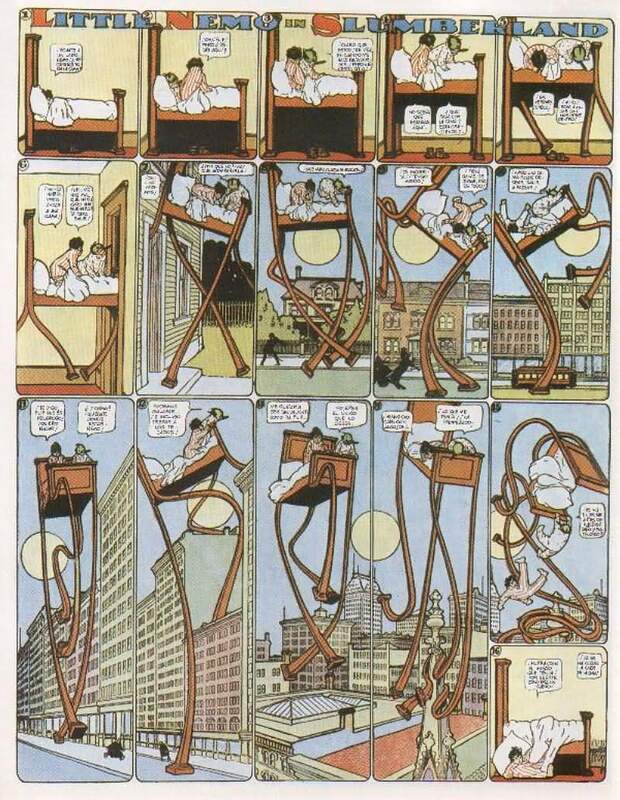 As in his comics work, McCay was decades ahead of his time. 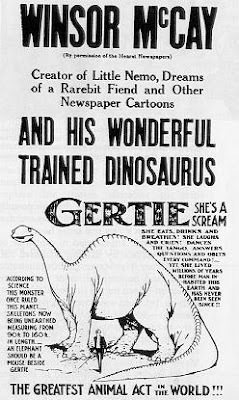 McCay used his Gertie movie as part of a live Vaudeville act in which he interacted with the dinosaur on the screen. She did tricks on command. At one point in the performance, McCay threw a pumpkin behind the screen that Gertie caught and ate on-screen. At the conclusion, McCay himself stepped into (behind) the screen and an animated version of the cartoonist took a ride on the beast. By all accounts, the performance was a sensation. Until the advent of computers, virtually all animation was done on cels, transparent celluloid sheets onto which the characters were inked and painted. Artists only made multiple individual drawings for objects that moved--sometimes an entire figure, sometimes just an arm or mouth. Because cels are transparent, the animators only needed to create one background painting for each scene, on top of which they layered the cels and shot one frame of film. Then they swapped out the bits that moved and shot another frame. Using transparent cels was an enormous time-saver. In 1914, they hadn't figured that out yet. For Gertie, Winsor McCay and a single assistant hand-drew both character and background in every frame. Every single frame. They redrew every rock, water ripple, and blade of grass thousands of time on 6 x 8-inch (15 x 20 cm) sheets of rice paper that were transparent enough to allow them to trace a master drawing underneath. Then McCay glued each sheet to a piece of cardboard so they all lined up, and shot them. There are a few hundred original Gertie cels left. I have one. 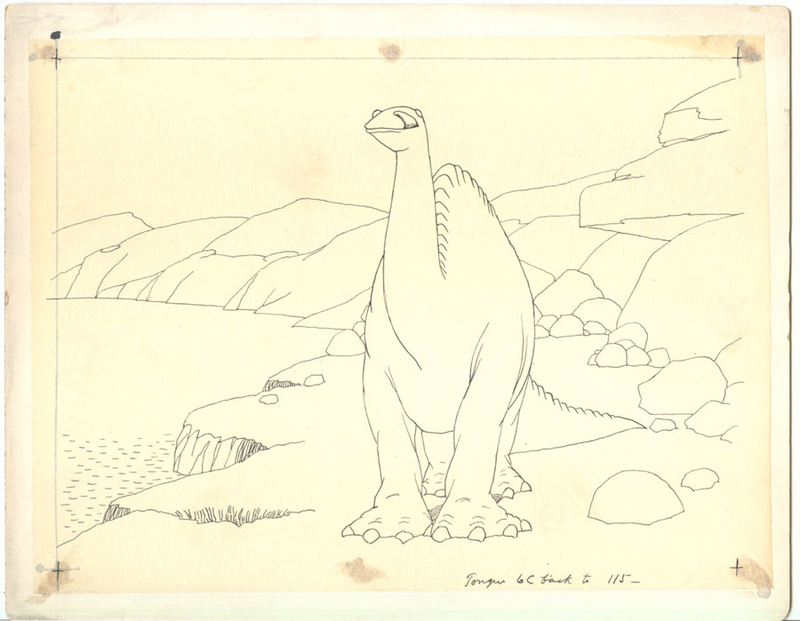 I had no idea that any Gertie cels had survived until I saw a museum exhibition of the collection of Mark Cohen, a comics collector and agent (whose widow, Rosie McDaniel, I've been lucky enough to know in recent years). I was taking in Cohen's fine examples of artwork from Peanuts, Luann, Cathy and so on, when I turned a corner and saw Gertie--matted, framed and spotlit. As I remember it, I literally went weak at the knees. Gertie immediately shot to the top of both my Bucket List and Grail List. Years passed; although I had the money to buy a Gertie cel, I didn't think I deserved to have one until I was a real cartoonist. The first check I received for Mom's Cancer was my permission slip. My cel appears at about the 2:37 mark in the clip above, as Gertie licks her lips after eating a tree trunk. In fact it appears twice, as McCay--no dummy--has Gertie lick her lips twice and re-uses the same drawings for each motion. I really don't consider myself the owner of this Gertie. I'm just renting it from history for a while, and feel a sacred obligation to be its faithful steward. I must say: you know how you get used to things hanging on your wall and, after a while, just walk past them without a look or thought? Well, sometimes I do. 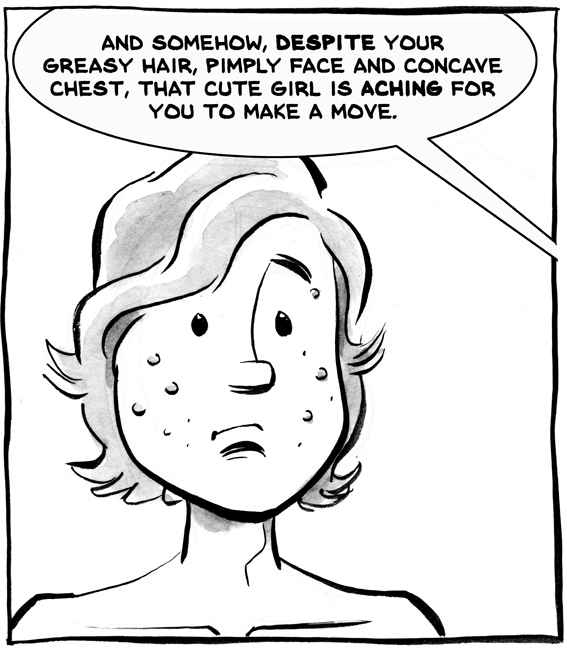 But sometimes Gertie still makes me weak in the knees. Highly Recommend Reading: Two books published by Peter Maresca that reproduce McCay's "Nemo" comics at their original enormous size: Little Nemo in Slumberland: So Many Splendid Sundays, and Little Nemo in Slumberland: Many More Splendid Sundays. More affordable is a terrific McCay bio by John Canemaker, Winsor McCay: His Life and Art (hey, it's an Abrams book!). Empaneled. Coro got a high chair because he came in late. I had a really nice time at the Sonoma County Book Festival this afternoon, particularly doing a panel on graphic novels with Paige Braddock, Brent Anderson and Justin Coro Kaufman, moderated by the graphic novel buyer for our local library system, Steve Alcorta. Unfortunately, Coro got caught in traffic driving up from San Francisco and showed up with only 10 minutes left in our hour, but it was a real pleasure to meet him and reconnect with Paige and Brent. We filled the room with around 45 people, said wise and witty things, and sold a few books. I especially appreciated seeing some friends and familiar faces turn up (Marion, Mike, Judy, Warren and Kristin and others). All that plus a knowledgeable moderator = a good panel. I like talking comics with comics-making people. Letting other people listen in is just a bonus. Paige, Brent, Me and Coro. My wife Karen got me my t-shirt when she visited the Library of Congress. It's a graphic of books on a shelf with a quote by Thomas Jefferson: "I cannot live without books." Seemed apt. The Space Shuttle Endeavour was flown over northern California yesterday, on its way to permanent drydock at the California Science Center in Los Angeles. I didn't see it (too busy working for a living) but my two girls did. Here are a few of my favorite photos of the flight. Splitting the towers of my favorite piece of civil engineering. 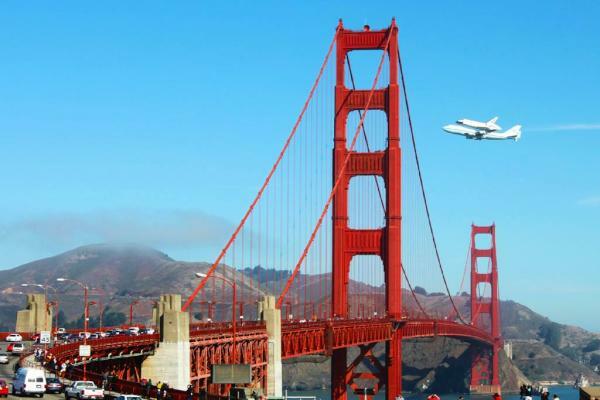 I think the angle of this shot makes the Shuttle appear lower than it actually was, but still: cool. 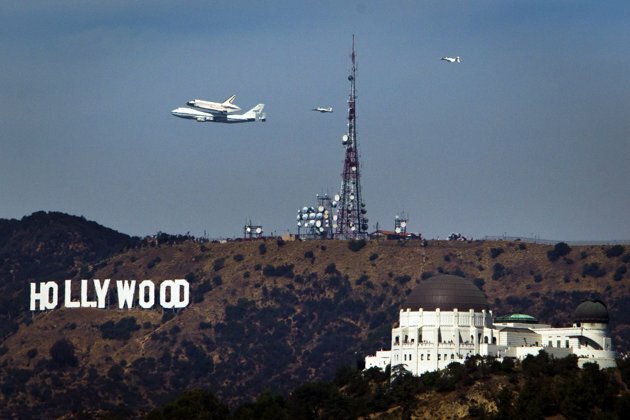 The iconic Hollywood sign is OK, but the winner for me is the historic Griffith Observatory at the right. The "Soarin' Over California" ride is one of the best attractions in the Disney California Adventure theme park across the way from Disneyland, so this photo of Endeavour . 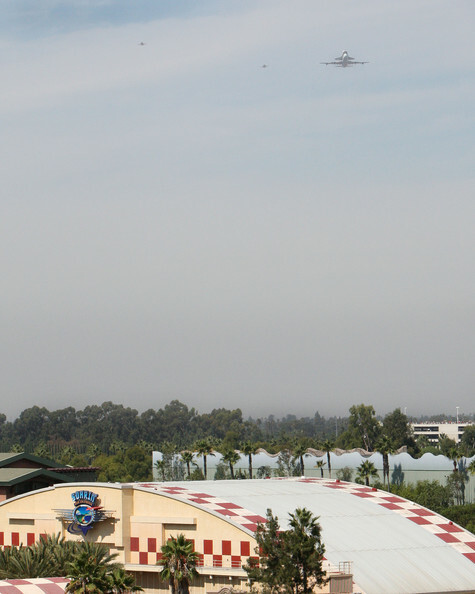 . . well, soarin' over Soarin' Over California . . . is hard to resist. 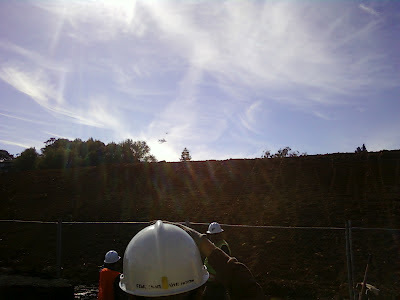 Endeavour flying over Vandenberg Air Force Base, capturing a big chunk of the history of flight in one image. Not a great photo of the Shuttle (just above the ridge) but my favorite because it was snapped by my daughter Robin on the site of her archaeology dig. I've read a few people bemoaning the end of the Shuttle era as a shameful surrender of American space presence. Someone online compared Endeavour's flyover to raising a white flag. I don't really see it that way. The Shuttles were old, outdated, and deadly. They'd killed before and, had they continued flying, would have eventually killed again. 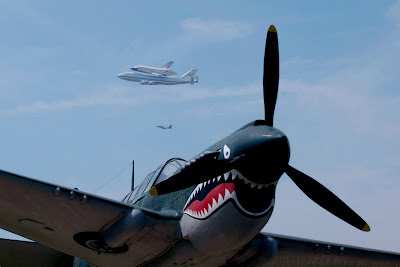 Their mission as originally conceived--essentially as delivery trucks to space--turned out to be more expensive than promised, bad for science (the size of the Hubble Space Telescope was limited by the size of the Shuttle cargo bay), and in many ways just a bad idea. Turning routine spaceflight over to private companies seems like a pretty exciting and smart idea to me, and frees NASA to push other frontiers. Yeah, we've got a small gap here where we need to hitch rides from the Russians, but we had a similar gap between Apollo and the Shuttle that no one remembers now. Give it a couple of years: we'll be back, smarter and safer than before. I look forward to seeing Space Shuttles in museums but am glad I'll never see one strapped to a rocket again. It's time. In addition to being a digital artist and cartoonist, Friend Of The Blog Jennifer, who sometimes comments here as "Namowal," is an experienced skydiver. Well, 75 jumps is more experienced than some and less experienced than others, but I'm sure she learned a lot from her latest jump in which she broke her arm and leg, and wound up in the hospital for more than a week. 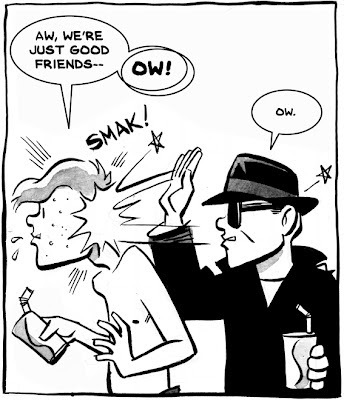 Luckily, fortune's slings and arrows are mere fodder for a cartoonist. 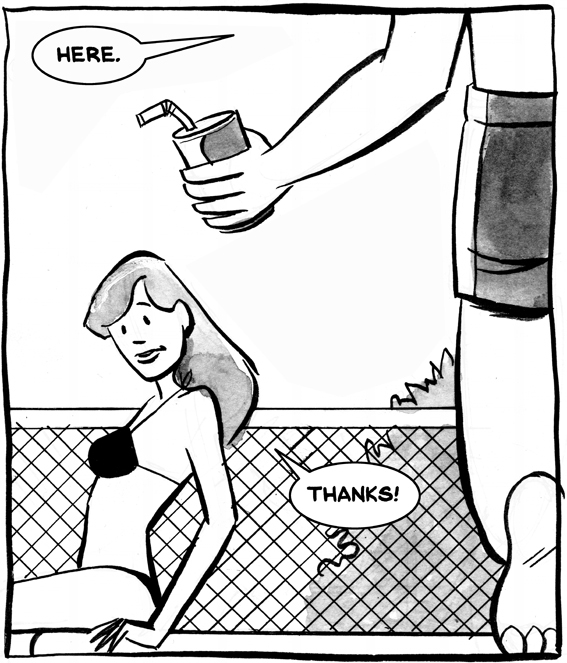 Jennifer has posted Part One of a harrowing yet funny comic describing her accident on her blog. You should go read that and then check back later for Part Two (EDITED later to add: Here's Part Two!). Jennifer's drawing of her left arm flopping uselessly in the wind as she plummets to earth will pucker every orifice you've got. Namowal, take care and get better--and get jumping--soon! 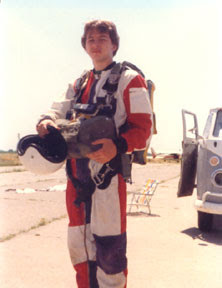 I skydived a few times when I was in college 30 years ago. I think it was a different sport then. First, it was a lot more Bohemian and laid back. Second, instead of starting with a tandem jump (strapped to an experienced skydiver) at 10,000 feet, we started with a series of static-line jumps at 3000 feet. The jumpmaster assessed your form and landing, and you gradually worked your way up to pulling your own ripcord at higher altitudes. I never progressed past static line but had good form and landed well, except for the one time I had the wind at my back and plowed a furrow with my face that was later used to plant a half-acre of corn. The school's instructor and jumpmaster, George, was a character. A Korean War paratrooper, George had a girlfriend half his age and undoubtedly first-hand experience with mind-altering substances, but took teaching and safety deadly seriously. Training was rigorous, and nobody got into the plane until George decided they were ready. One cold morning, George and a couple of us were gathered around a fire blazing in a steel drum, which George periodically fueled with a squirt of gasoline from a 5-gallon can. We eyed him warily, and I think someone might've even asked if that was such a good idea, but George was cool. Suddenly, an arc of flame leaped up the stream of gasoline to the can and ignited it. Everyone scattered as if a grenade had been dropped--everyone but George, who calmly placed the can on the ground, put his foot over the spout, and stood there like Captain Morgan with flames licking at his boot and pants cuff until the fire was snuffed. That combination of reckless risk and calm crisis management is my enduring memory of him. As I say, I only jumped a few times and probably wouldn't have done it again even if George hadn't died while skydiving in 1983. But that sealed it. First, George was my jumpmaster, I didn't know or trust another. Second, I figured if a split-second accident/mistake could take out a Zen Master with more than 3000 jumps in his log, I didn't stand a chance. One of the first real articles I wrote in my new job as a cub newspaper reporter was George's obit. I figure there's enough real risk and thrill in life without me needing to manufacture it, but understand and respect--to a point--those who feel otherwise (that point being a family or real obligations to others, after which I think it's unnecessarily selfish). Ah, but to grasp the strut of a plane's wing, arch your back and step off into space . . . feel the canopy gently open overhead and see the ground rising slowly between your legs . . . now that's a memory to last a lifetime. Few people are fortunate enough to have photographic documentation of the exact moment in their lives they were as cool as they were ever going to get. I do. Also, if your skydiving school isn't run out of a broken-down VW van, you're doing it wrong. What a terrific time I had as a guest on the Jordan Rich Show, WBZ Boston, last night! I guess my host agreed, since I was originally scheduled to do 30 minutes and he asked me to stay on to fill the entire hour. Hard to believe how fast it flies. It goes without saying that Jordan is a pro, but I was impressed again with how smoothly his show runs, how much research Jordan did to prepare (e.g., he read my blog! 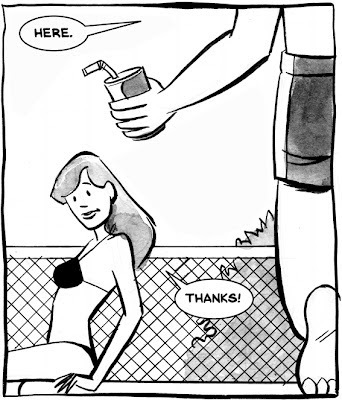 ), and what a good conversationalist he is. You start talking to him and forget you're being broadcast on a 50,000-watt station that covers the eastern U.S. and Canada. I think what I appreciated most was Jordan referring to me a couple of times not just as a writer, cartoonist, etc., but as a "thinker." No one has ever accused me of that before. I liked it. Unlike my previous appearance, we took a few phone calls this time: one from a woman who'd survived cancer and was still deeply emotional about her experience, another from a man who wanted my opinion on whether future humans might evolve to have wings like birds. I actually loved the latter question; if you just kind of take it on its own terms and roll with it, it's fun to ponder. Best of all, Friend O' The Blog Jim O'Kane called in (which Jim and I later agreed might be the first time we've ever had a voice-to-voice conversation after a few years of being Internet friends) to say some nice things about my work and ask Jordan and me our favorite "Star Trek" episodes (Jordan: "City on the Edge of Forever"; me: "Balance of Terror"). 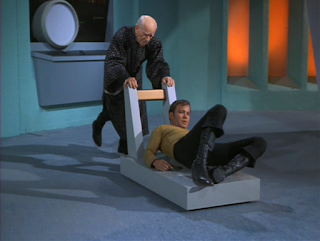 But it wasn't all "Star Trek." We also touched on the Space Race, optimism, pessimism, science fiction and pop culture as mirrors of society's hopes and fears, graphic medicine, and other topics you'd expect to come up if you invited me onto your major-market late-night radio talk show. Many thanks to Jordan and his listeners--especially his callers, and especially especially Jim, who got me the gig a year ago in the first place. I lost count of how many I owe you. To quote James T. Kirk (albeit under different circumstances): "It was fun." Having already waxed enthusiastically about the recovery of lost audio recordings from the 1880s, I could hardly let this pass: the restoration of what may may have been the first experimental color movie from 1902. So early! This video explains the process invented by Edward Raymond Turner and patented by him in 1899. It's enormously clever and totally unlike later commercial color film processes, which left modern researchers with the same problem they faced with the old sound recordings: no way to play it back. The machines don't exist anymore (and good luck finding a Betamax videotape player in 2112). Also like the old sound recordings, digital techniques and technologies solved the problem. There are so many things I love about this, I hardly know where to begin. Because of Turner's color process, the red, blue and green break up at the edges of moving objects, giving the films a blurry, dreamy quality I really appreciate. Turner's inventiveness is astounding, his wheel of alternating color filters very smart. It again reminds me of the recovered sound story, with the same turn-of-the-century explosion of ideas explored by individual inventors in little shops around the world. Watching these films is a bit like discovering a time machine, isn't it? In fact, although I'm very happy to have been born precisely when I was, if you held a phaser to my back and forced me into a time machine I think I'd choose to land in 1890 or so. Movies, phonographs, light bulbs, telephones, automobiles, airplanes. Electricity in the home! What a couple of decades that must have been. Mr. Turner's color movies exemplified the era's spirit of fertile, creative, limitless invention. Turner died young (29) and his work, though developed further by others, was superseded and forgotten. As a representative of the 21st Century, I'm pleased to do Turner the honor of remembering it, and marvelling at it, again. a time machine and sent back to the 1890s. On the night of Sept. 14/15, I'll be a returning guest on the Jordan Rich Show on Boston radio station WBZ, part of the CBS Radio Network heard from border to border, coast to coast and all the ships at sea. I'm currently scheduled to spend about a half hour talking comics and graphic medicine with Jordan at 2 a.m. Eastern/11 p.m. Pacific. If you're up late and in an area that doesn't broadcast it, you can listen in live online. I did Jordan's program once before and had a great time. He's a very good host, and a good egg off the air as well. I don't know if we'll talk about it on the show, but Jordan asked me to contribute to his annual "For the Children" fundraising booklet, which he's done for 12 years to benefit Boston Children's Hospital. I put together a page distilling the optimism and inspiration of WHTTWOT that I think will fit in with the essays, poems, recipes, and other contributions Jordan collects from his guests, some of them quite well known. I'll share that page a little later in the year, when the booklet becomes available. Then on Saturday Sept. 22 at 1 p.m., I'll be part of a panel on "Novel Storytelling: The Art of the Graphic Novel" at the Sonoma County Book Festival, Courthouse Square in downtown Santa Rosa, Calif. Others on the panel will be terrific comic book artist Brent Anderson ("Astro City"), cartoonist Paige Braddock ("Jane's World"), and artist Justin "Coro" Kaufman (all kinds of stuff, including book covers and movies). I know Brent and Paige, and am looking forward to meeting Coro. NOTE: our panel will be located a block off Courthouse Square at the Share Exchange, 531 Fifth Street. Because holding it where festival-goers will be gathered and might easily find it would be silly. I like this festival, which I've attended as just a book lover. It's pretty low-key: booksellers, small publishers and self-publishers set up tables around the town's central plaza, with speakers and panels happening at different times and places. It's a neat regional event that draws visitors and participants from not just the county--which is disproportionately lousy with literary talent itself--but the greater San Francisco Bay Area. It's a nice place to meet some folks and sell some books. There's a movie coming out later this month, "Looper," whose premise appears to be exactly the same as "The Adventures of Old Time-Traveling Brian" if old Brian were a mob hitman from the future and young Brian were assigned to kill him. See?! Exactly the same! I think I'll sue.